Intense color, elegant oil-shine! Explore all 22 intense and captivating shades of the new L'Oreal Paris L'Huile nail paints. 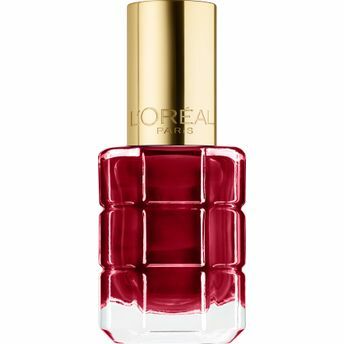 L'Oreal brings to you a nail polish enriched with a blend of precious oils and intense color pigments, for the most sophisticated, powerful colors and shine in one stroke. With a patented flexi brush for the easiest, most precise application. The wide fan shaped brush with over 400 bristles allows for a precise and quick application to the nail and is drip-resistant to help achieve a perfect finish. Nail polish enriched with a blend of precious oils. 22 intense and captivating shades. Additional Information : A global beauty care brand, L'Oreal Paris believes in the essence of helping every woman embrace her unique beauty while reinforcing her innate sense of self-worth with their internationally renowned, diversive products. The brand has wide range of affordable luxury, high-quality products in categories like skin care, hair care, hair color and makeup. Explore the entire range of Nail Polish available on Nykaa. Shop more L'Oreal Paris products here.You can browse through the complete world of L'Oreal Paris Nail Polish .Alternatively, you can also find many more products from the L'Oreal Paris Color Riche A L'Huile Nail Paint range.